The Strawberry Daiquiri and the Strawberry Margarita are great drinks, but they're not the only strawberry cocktails you can mix up. When you're in the mood for this luscious berry, we have a few recipes you'll definitely want to try. Many of these drinks rely on fresh strawberries though some use a strawberry syrup, liqueur, or vodka. A few are frozen, some are martinis, and others are served tall. They all celebrate those beautiful berries with an array of interesting flavors. Strawberry lemonade is great, and strawberry lemonade with vodka is even better. That's what you get from this super quick strawberry berryoska cocktail. The recipe features the smooth taste of Russian Standard Vodka along with lemonade. The fresher the lemonade, the better because your strawberries are as fresh as can be. This is a drink you can enjoy all summer long. Strawberry syrup is a great ingredient to stock in your summer bar and it's very easy to make at home. When you add that sweetened berry to a cocktail like the gin and tonic, you take the drink from dry to delicious. The strawberry gin and tonic is, quite simple. You'll add equal parts strawberry syrup and lime juice to your glass, pour your favorite gin, then top it with tonic water. It's a fun twist on a favorite cocktail. Bourbon pairs perfectly with strawberries as you'll found out with the first taste of the Kentucky kiss cocktail. The recipe is incredibly simple and a great way to enjoy whiskey on a warm day. The drink features Maker's Mark, a bourbon you can rely on for great cocktails every time. You'll also need a strawberry puree, maple syrup, and a little lemon juice. It mixes up in minutes and is a true delight. When you're looking for a romantic drink, any strawberry cocktail can act as your aphrodisiac. Yet, you'll find the Cherub's cup to be just a little better suited than the rest. This interesting recipe uses St. Germain along with your favorite citrus vodka, though the Hendrick's Gin option is a nice match as well. 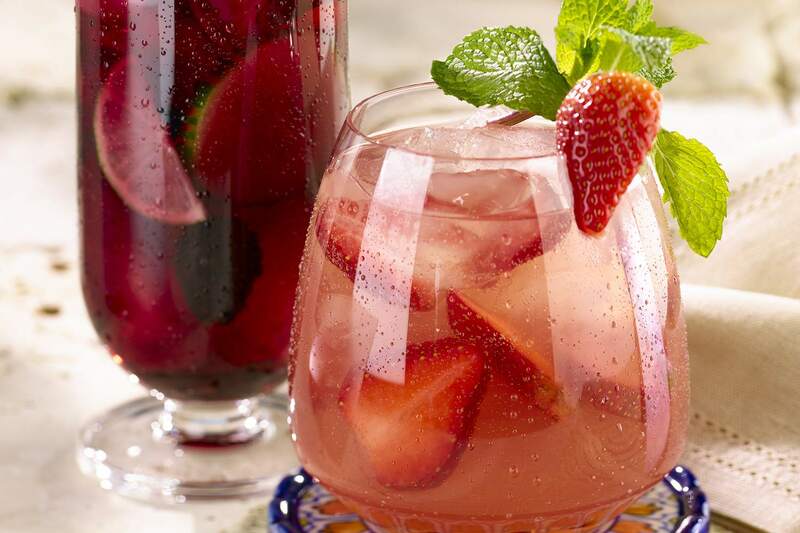 Add a muddled strawberry, a couple accents, then finish it with a sparkling wine. It's absolutely lovely and surprisingly simple. Basil is one of the best herbs to pair with strawberries and you'll see it often if you browse enough cocktail recipes. The Orchard catch cooler is a perfect example and this casual highball is perfect for game day. Along with the berries and basil, you'll need simple syrup and fresh lime juice. The alcohol is a double whammy: vanilla vodka and Angry Orchard Crisp Apple Cider. The mix is fantastic and it's a simple way to improve hard cider. If the cooler doesn't convince you that strawberries and basil are a perfect pairing, give the Union Square a try. It's a little fancier, but that doesn't mean it's any more difficult. What you'll love about this recipe is that it uses New Amsterdam Gin, a surprisingly impressive option given the reasonable price. It's a nice background for the featured fruit-herb combination and agave nectar and two citrus juices bring it all into balance. On the lighter side of things, strawberry and basil come together once again but in completely different forms. The sparkling strawberry rosé relies on a strawberry vodka and basil simple syrup. It's easy to make both of those ingredients, just leave a week or so for the vodka. When it's time for a drink, add pear nectar and lemon juice, then finish it up with a sparkling wine. It's a nice, fresh drink for summer. Use this simple Champagne cocktail to test a couple of your bartending skills. It's an impressive yet simple drink that requires muddling and a sugar-rimmed glass and it's another good one for lovers. The Stoli accomplice uses Stolichnaya Vodka along with three muddled strawberries and a hint of syrup and lemon. The wine rounds off the flavor and a simple strawberry garnish gives it an elegant appearance. Another way to add the sweet taste of strawberries to your cocktail is to pour a strawberry liqueur. Granted, there are not many available, but they're around and they make great drinks. The rhube puts it to good use, pairing it with an aged tequila and rhubarb soda. You have two options for that ingredient, one is to buy Dry Sparkling Rhubarb. The other is to make the soda yourself. Either way, this is a cocktail you really should try. One of your strawberry liqueur options is crème de fraises. Like all crème liqueurs, it's not creamy but gets its name because it has more sugar than most. This is perfect for a flavor like strawberry. The Victoria's secret has long been a favorite cocktail and it's one of those delightful, fruity martinis. To go along with the liqueur, you'll need a citrus vodka and a little lemon juice. You really can't get much easier. You should have no problem finding Strawberry Pucker because this schnapps is very popular. Next time you grab a bottle, pick a bottle of Jim Beam Red Stag as well. You will be all set to mix up the Red Stag lemonade. The recipe is simple and pairs the cherry whiskey with the strawberry schnapps before adding lemonade and soda. It's refreshing, fruity, and requires no special tricks; just a simple, tall drink. We're going to turn back time for this cocktail and we'll stop just after Prohibition. The Champagne bowler dates back to the 30s and it is definitely a drink for wine lovers. We have not one, but two wines in this recipe: a white wine and a sparkling wine. In addition, you'll pour a shot of Cognac. All of that is piled on a muddle of strawberries and syrup. It's a fun blast from the past and one that's hard to pass up. Grab the blender and a few fresh strawberries because you won't want to miss the Christmas Jones recipe. It's a fun blended cocktail that has some sparkle to make it a little more interesting. The spirit of choice here is vodka and it's okay to be cheap if you like. The vodka will be masked by the strawberries and pineapple juice. When it's all said and done, top it with lemon-lime soda. How can we have a bunch of strawberry cocktails without chocolate? The love potion #9 is coming to the rescue and this delicious ice cream cocktail is a fantastic way to finish things up. To create this tasty treat, choose your vodka: strawberry, vanilla, or clear. Then, you'll add crème de cacao, a healthy dose of strawberries, and some vanilla ice cream to the blender. Blend it up and enjoy.